(CISA): Wild winds and choppy seas were the order of the weekend making for exciting racing in the Ridley J22 National Championships. The weekend’s racing had two purposes; the National Championship and gaining final qualifying points for the Race Cayman International Regatta that takes place from 14-17 March 2013. Nine boats competed in three races on Saturday afternoon and there was strong competition for the front runners Ciao, Yahoo, Just Leaving who took the championships and Sunshine. 15 knot winds led to some exciting racing with Ciao skippered by Tomeaka McTaggart leading after day one. The rest of the fleet were close behind, dicing for the minor places. The conditions on Sunday made for difficult racing with near 20 knot winds and occasional large swells on North Sound. The racing was close with Just Leaving skippered by Mike Farrington taking the day with consistent first places. Ciao battled for second, with Calima skippered by Eduardo Bernal in third place overall. The high winds caused problems for many in the fleet with only three of the eight starters not experiencing major difficulties down wind. Tired sailors enjoyed the presentations and a social evening catered by Terrie Farrington and her Social Committee team. 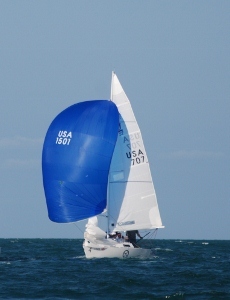 J22 club rep, Matt Diaz said, “It was great to have nine boats racing for this regatta and I commend the crews who have spent many hours on the water training for this event. Thanks must go to our dedicated race committee who braved the conditions, making the racing possible”. Photos of the weekend racing are available on the Cayman Islands Sailing Club’s Facebook page. The points gained by Just Leaving and Ciao will see them along with Yahoo skippered by Bruce Johnson representing Cayman in the Race Cayman regatta, an invitational event. This year’s regatta will see six international teams come to the Cayman Islands to compete with our best, while enjoying Cayman hospitality and the competitive sailing conditions our Island has to offer. For further information on Race Cayman and the Cayman Islands Sailing Club please contact the club on 947 7913 or admin@sailing.ky.